Tough odors can seem impossible to conquer. We have the perfect solution. Our odor eliminator naturally neutralizes the stink, even from skunks. 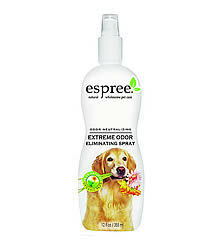 Rescue your pet with Espree’s propriety blend that includes Aloe Vera, Alum and our secret odor eliminator: Agent 20. It’s like the stink was never there!